Most people know this however, have you ever taken the time to decorate your own plate, tray, mug, light switch cover, anything? 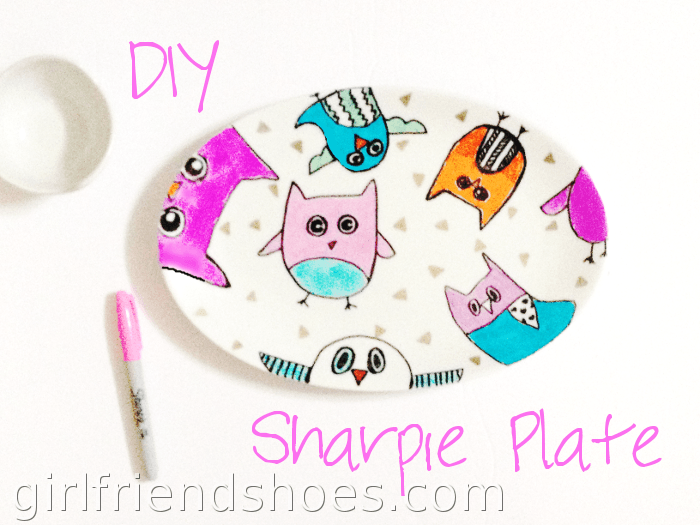 I bought a plain white plate at the dollar store specifically to do a DIY sharpie plate project and it turned out so cute. I used a mug set with owls on them for inspiration that I recently purchased at Winners. My plate is super colorful and who doesn’t love a cute owl here and there?! I used regular sharpies for the owls and then used a shiny gold sharpie for an accent scattered around the plate. Looks much nicer in real life than the picture, you just can’t get the shine of the gold looking at the picture. Now I have to bake it to keep the Sharpie from coming off. 350 degrees for 30 minutes is what seems to be the consensus. I’m going to spray a clear sealer on it anyway. I hardly cook so it’s not likely that this plate will see a lot of food. I think it would make a nice cracker tray or something. Or just sitting there looking cute on the counter like a good little plate. Share your Sharpie projects with us in the comments, we’d love to see!